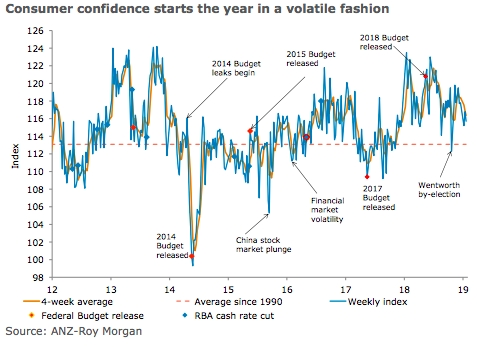 Australia’s ANZ-Roy Morgan consumer confidence was down 0.9 percent last week, giving back much of the prior week’s gain. The overall index is still above its starting point for 2019, though it is almost 5 percent lower than its average for January 2018. Financial conditions declined, with current and future financial conditions falling by 0.3 percent and 2.4 percent respectively. Both indices are around the levels seen this time last year and above long-run averages. Economic conditions were mixed, with current economic conditions gaining 3.4 percent while future economic conditions fell 0.7 percent. These indices are 6–8 percent below the levels that prevailed in January 2018. The ‘time to buy a household item’ index fell 3.2 percent. Four-week moving average inflation expectations declined by 0.1ppt to 4.2 percent. "It has been a volatile start to the year for consumer sentiment, with the index displaying a down-up-down pattern, though encouragingly it remains above the long-run average. The global news is not helping, with China slowing and political developments in the UK and US dispiriting. Domestically the focus remains on the weak housing market, though as we noted in Friday’s Australian Macro Weekly the evidence of a wider negative impact is still quite limited. Employment will be the key domestic data event this week," said David Plank, ANZ’s Head of Australian Economics.